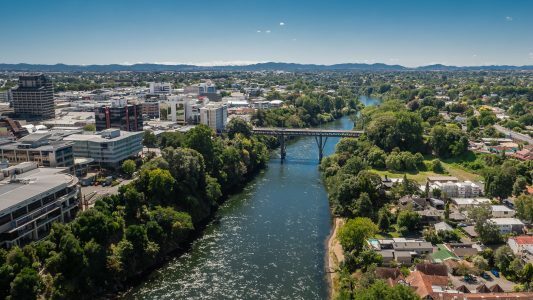 Hamilton is New Zealand’s largest inland city, and fourth largest urban area, with a population of around 165,400 (2017 estimate), 16.6% of the residents being over 60 years. The city enjoys a temperate climate, flat topography, the Waikato River and a central lake. A wide variety of policies and programmes for older people already exist, through local and national implementation. These include a universal pension and discount Gold Card (for those 65+), free public transport around the city during weekends and work hours, discounts off many forms of entertainment (e.g. movies, concerts), and free emergency health care. The city has a hydrotherapy swimming pool, many public parks including the internationally prized Hamilton Gardens, and modern rest homes and retirement villages. The Waikato hospital includes a newly opened Older Persons Rehabilitation Unit. Current plans to make Hamilton more age friendly include major initiatives by the Hamilton City Council, sports and health organisations, emergency services, and by older people’s agencies. Such plans are to continue, enhance or establish new initiatives, such as to: consider the needs of older people in reviews of Annual Bus routes and triennial Public Transport Plans, publicise the Good Homes Repairs and Maintenance Manual, continue the annual Kaumatua Games, install exercise stations in Retirement Villages, record oral histories of older Hamiltonians, expand circulation of free newspapers and increase uptake of Green Prescriptions, investigate an Integrated Response Model re older peoples safety concerns, provide refresher training for older drivers near driving reassessment, and establish regular updates on the Age Friendly project through the media. To do this, Hamilton has an Age Friendly Hamilton Steering Group, sponsored by the Hamilton City Council, which has been developing a four-year plan of action (2018-2021) over the last year, along with negotiating and implementing various activities. The emphasis is on “building on what we already have”, “working together” through a collaborative approach among agencies, and “encouraging local community action”. As well, Hamilton has a diverse ethnic population, with almost a quarter of the population born outside New Zealand, so that “being culturally appropriate for older people” is a new phenomenon for everyone.